The MDF monthly e-newsletter, the MDF Dispatch, provides you with up-to-date information on research advances, DM daily living strategies, upcoming events and stories from MDF community members. It is the best way to stay current on news in the DM community. Fill out the form below so we can include you in our monthly e-newsletter distribution and other emails, or call us at 86-myotonic (866-968-6642). 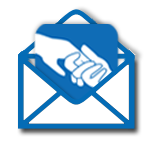 If you are already receive email updates from MDF, you can update your contact information here.